"Boddington on John X Safaris…." Throughout the course of a Professional Hunters career you have the pleasure of meeting interesting folks from all walks of life. Each safari is greeted with the same optimism and enthusiasm as the one before, with the anticipation of the hunt driving one from one day to another. On most occasions we know very little about the hunter/res we’re about to collect from the airport, but on this particular occasion we felt like we were collecting an old friend, especially if you were to judge the state of all the “Boddington on….” DVD covers sitting worn out on the television stand at home. Like many of you, we’ve followed Craig for many years. 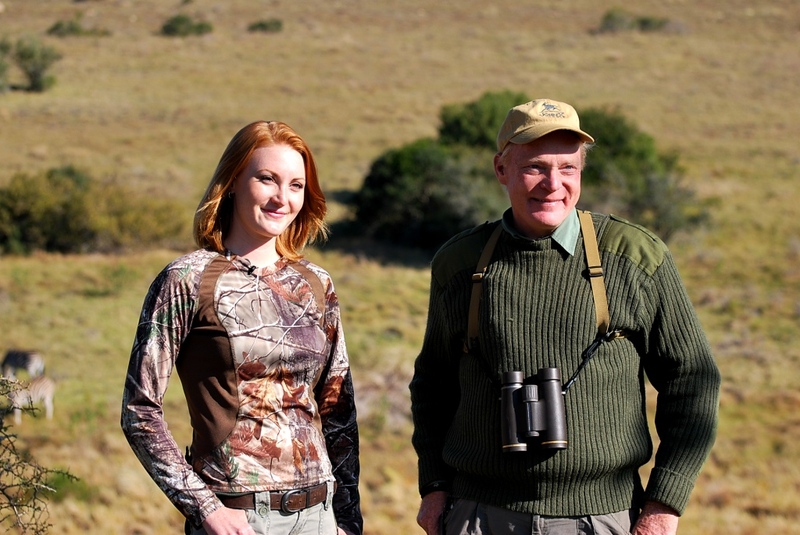 May it have been through his writing of any of his 24 published books, interesting hunt reports of new uncharted hunting grounds, various DVDs, and of course his regular television shows – Craig Boddington was no stranger arriving to John X Safaris. 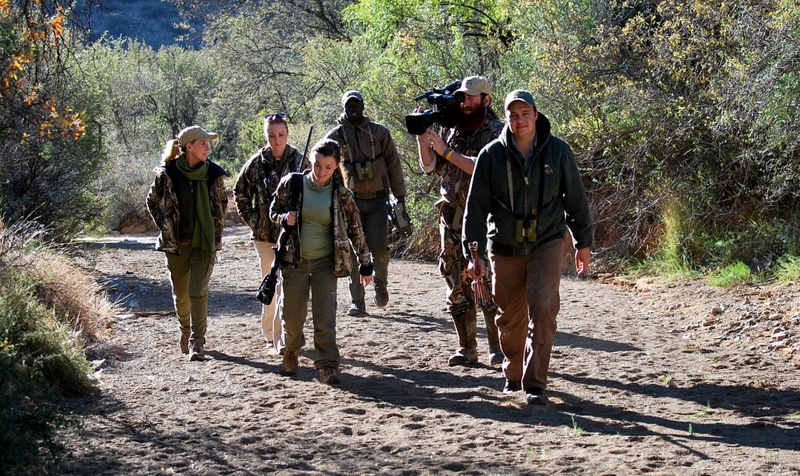 On this particular hunt, together with Craig, was his wife Donna, daughters Brittany and Caroline, and trusty cameraman Matt Young. The hunt was to be Caroline’s maiden trip to Africa – her first taste of Africa! We started our hunt in the south from the coast with an exciting Caracal hunt over hounds for Craig, before heading out for Caroline’s first Zebra. With a bout of cold weather hitting the coast we headed north, hoping to escape the front. A Gemsbuck and Black Wildebeest for Caroline, a great free range East Cape Kudu for Brittany, and a Hartebeest for Craig, hunted in magnificent Karoo conditions formed the backbone of our trip. With our safari coming to an end we turned back south, bagging a magnificent Zebra for Donna and a old Blesbuck ram for Matt on that last day. A busy, but exciting safari had passed in the blink of an eye. After the Boddington’s had left, many of my peers wanted to know what it was like guiding someone as famous as Craig Boddington? In short – a privilege. Without hesitation or the slightest doubt I would consider Craig one of the most interesting people I have ever met. To guide a guy who has hunted in Africa longer than most is one thing, but to guide someone who has travelled extensively throughout Africa in the manner that Craig has is an experience to behold. Consider the fact that Craig hunted legally in Kenya before its closure to hunting in 1977, one gets the picture of how much this man knows about African hunting. He has seen numerous African countries, and for that matter countries the world round, open and close, only to reopen to hunting again, over the course of his career. He has witnessed more sunrises and sunsets in faraway lands than most adventures could dream of, and has done so for more than 40 years, recording his experiences through his writing. Throughout all this he has remained a humble individual, a family man, and great hunter. For the man I met and the privilege of sharing 8 days with him and his family will be a safari I for one will not be forgetting soon. To this end you’d be glad to know the entire hunt was filmed to be broadcast on Petersen’s Hunting, on the Sportmans Channel within the next 12 months. Craig will also be writing and publishing numerous articles about his experiences at John X Safaris, which is why we’ll only be sharing pictures of their hunt at this stage – it’s not everyday that our newsletter sees the likes of a famous writer contributing articles towards its many posts. Until then enjoy the images, AND don’t miss the show – there were some unbelievable hunts captured on film!